Crazy Stuff I Do: Cat Beaten by a Piece of Lettuce - Yes, My Cat Eats Lettuce! Cat Beaten by a Piece of Lettuce - Yes, My Cat Eats Lettuce! I've got a cat named Socks that will eat just about anything... except blueberries. He actually had this bad habit when I found him and it just seemed to escalate over the years. If I drop something on the floor, he is there, waiting to grab it before it hits the ground. This cat will actually eat lettuce. If I drop small bits of my salad lettuce on the floor he will eat it. 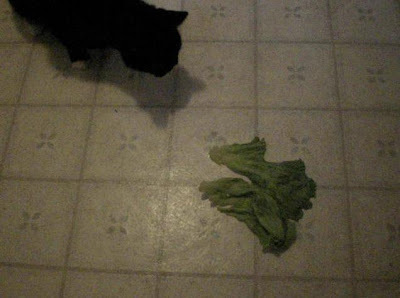 Cat vs a piece of lettuce. He wants to eat it, but is afraid of it because it got hooked on his paw when he grabbed it. Just before I took this video clip, I peeled the outside off of a new head of lettuce and put it on the counter. I accidentally knocked it off and when Socks ran over to it he reached out and snagged it with his paw. However, it got caught in his claw and flipped over toward him and because is was much larger than he was used to, it scared the crap out of him. He ran and hid in the corner. LOL! In this video taken shortly afterward, he wants to eat it, but is still afraid of it and is very tentative about touching it. Normally, it would be gone in 2 seconds. Cats... They Like to Use Kitchen Appliances Too!